After successful presentations and good sales results at fairs in Hong Kong, Yokohama and South Korea last season, Croatian boat building company AD Brodovi (boats) from the Adriatic town of Solin exhibited its "Salona 41 IBC" sailing boat for the first time in China at its leading yacht and business jet show Hainan RendezVous. With Asia a growing market for sailing, China is one country where growth is expected in the next few years. 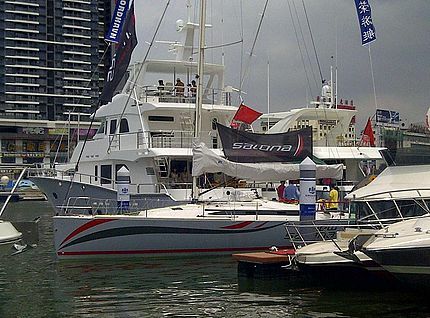 Along with the French group Bennetau and American group Hunter, the new Salona 41 was the only sailing boat that was exhibited in the water at the Hainan fair. After the fair in Hainan, Salona will be exhibited at a fair in Shanghai from 19 to 22 April and then at the traditional Hwaseong Boat Show in South Korea, where they will display two boats in the water. Exhibiting at local fairs will round off a successful season for the Solin boat building company, which will celebrate its 10th birthday next year.